Irish t-shirt is a long sleeve design that features the Gaelic saying PÓG MO THÓIN along with Celtic knot-work design. PÓG MO THÓIN on this long sleeve Irish t-shirt is pronounced poge mo hone in the Gaelic language and translates to Kiss My Arse in English! 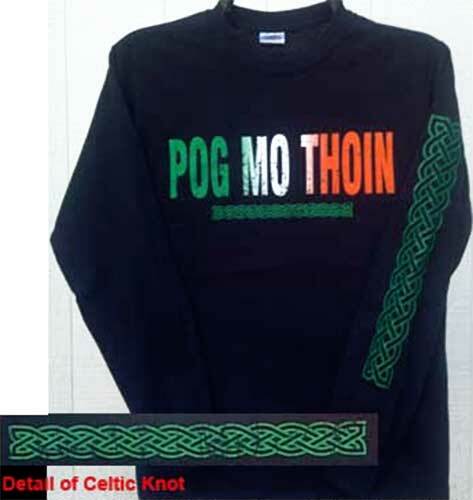 The PÓG MO THÓIN t-shirt features distressed green, white and orange lettering along with a Celtic knot design on the chest. The Celtic knot-work is repeated on the left side long sleeve. This long sleeve Irish t-shirt is pre-shrunk cotton and it is an exclusive design of The Irish Gift House. The black long sleeve Irish t-shirt is received with a Celtic knot history card. Long sleeve Irish shirt features your Irish coat of arms prominently displayed on the chest.